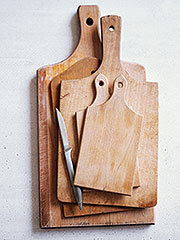 Real Simple featured a question recently about cutting boards. Is it safe cut meat on wooden cutting boards? While some may assume it is not ok since the raw meat juice could get stuck in the crevices a knife makes into the wood, Real Simple experts suggest otherwise. Carl Winter (a food toxicologist and holds a PhD at UC Davids) says that it is ok if the cleaning up is done just right. Use hot water - the hotter the better - along with soap to wash the board throughly. Make sure to dry the board with a paper towel. If you leave it out to dry, bacteria can quickly grow. Personally, I like the idea of using color coordinated jelly boards (available at Crate and Barrell $9.95). You've got your "meat" board separate from your other cutting boards. Although my sister has one of those 8x8 slabs of granite as a cutting board right by her sink. I like that idea too. Ooh and I like this tip from Real Simple too. If the jelly boards frustrate you because they slide around on a wet counter while you're chopping your basil, put a dish towel underneath and you have an instant non-skid cutting board (for cheap). I love wood cutting boards! It's the only way to go. I too was worried at first, but they naturally push the bacteria out. WOoden spoons, same thing. We are even considering wooden butcherblock countertops from IKEA. I love it! I love wood cutting boards too. I think when I bought our knives, the William Sonoma "knife expert" told us that silicone boards were the easiest on the knives. If you've invested in good knives, the granate is probably something to avoid (it dulls them!). Although granate is the easiest clean. I really like having the color-coded jelly boards, Missy. And Real Simple's towel under the board idea is a good one as well. Why would anyone want a wooden cutting board when you can just throw the jelly one in the dishwasher and know for sure that it is sanitized? Is there something special about wooden cutting boards that I'm missing out on Sarah? Or Kelli? Or Miss? "Wood has some advantages over plastic in that it is somewhat self healing; shallow cuts in the wood will close up on their own. Wood may also have an advantage over other materials due to its natural anti-septic properties. Hardwoods, which have tightly grained wood with small pores, are best. Good hardness and tight grain helps reduce scoring of the cutting surface and seepage of liquid and dirt into the surface.."